My repertoire of being a short-cut cook combined with my undying love for Chinese food, led to the invention of this recipe. Mushrooms cooked in spices time and again was getting a bit banal. So I decided to add a bit of Chinese spin to it. Cooked in a jiffy without compromising on the flavour, this one’s sure to win you over. 1. Heat oil in a pan and fry the cut sausages. Remove from the oil and keep aside. 2. In the same oil add ginger, garlic and chillies and fry till they release their fragrance. 3. 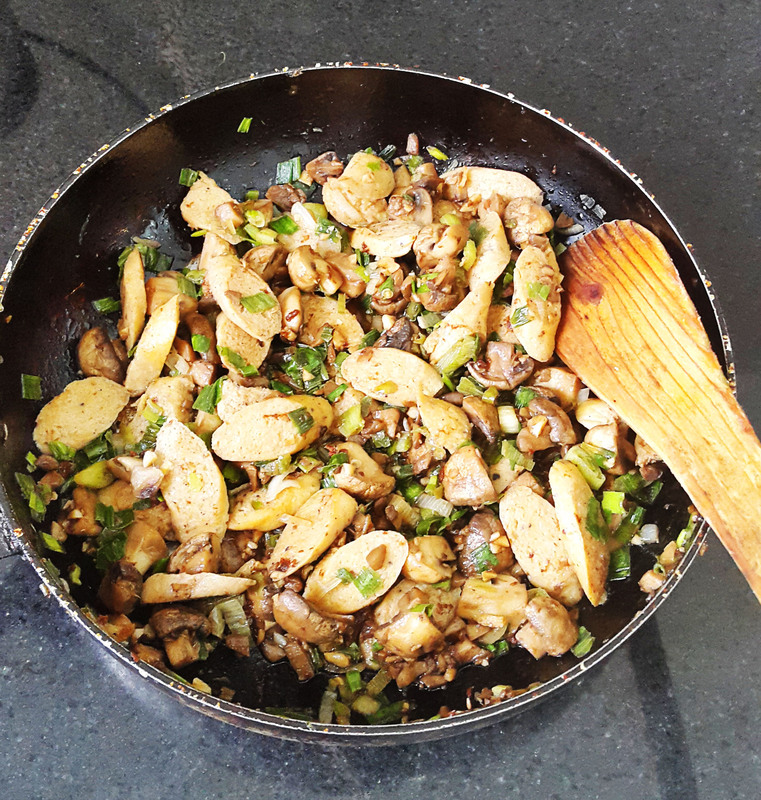 Add mushrooms and stir fry but don’t overcook them. 4. Then add the sausages to this mixture. 5. Then add the sauses, salt, aginomoto and stir. 6. Lastly add the spring onions and stir. Adding spring onions at the end prevent them from getting overcooked retains their colour. 7. Cook on medium flame for 1-2 minutes. P.S. : You can replace chicken sausages with pork or lamb. A great companion for veg/egg/chicken fried rice. Can also be savored as Starters.